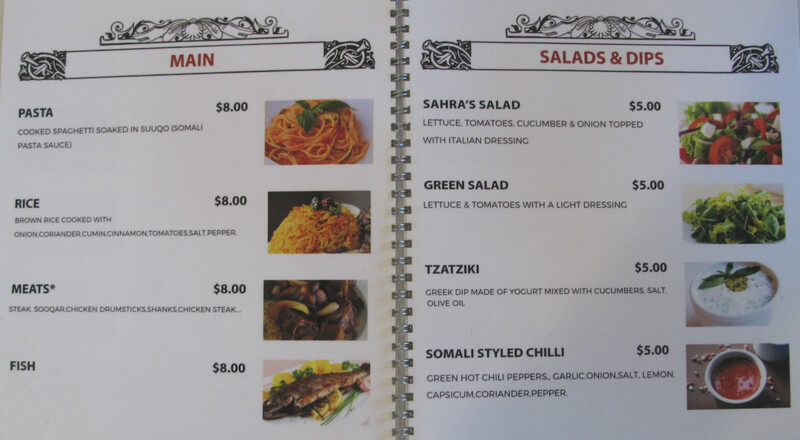 Sahra’s Kitchen is the final regular Racecourse Road Somalian eatery to be covered by CTS. We’ve held off for a couple of reasons. We’ve eaten here a heap of times, but truth be told it has long seemed to operate at least partially as something of a community hub for the local Somalian community. While we’ve always been made to feel welcome, it has presented as being a little less open and viable for members of the general public. Plus, the last time I stepped in here, they’d run out of rice! There’s no such problems this time around as Bennie and settle in for a mid-week dinner. Indeed, the place had been tidied up and refreshed. There’s cool, matching furniture and even some artwork on the walls. We find the service prompt and cheerful. 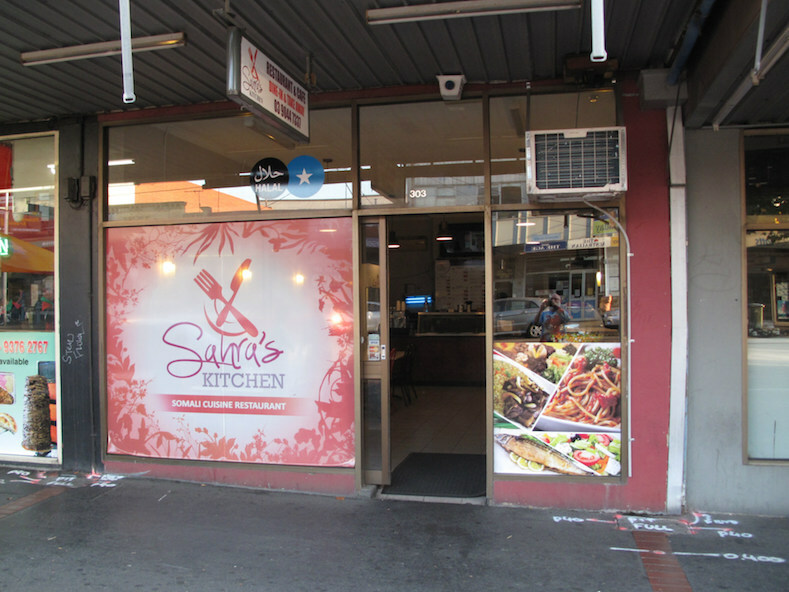 Sahra’s Kitchen is definitely open for your business. And there’s rice in the house! 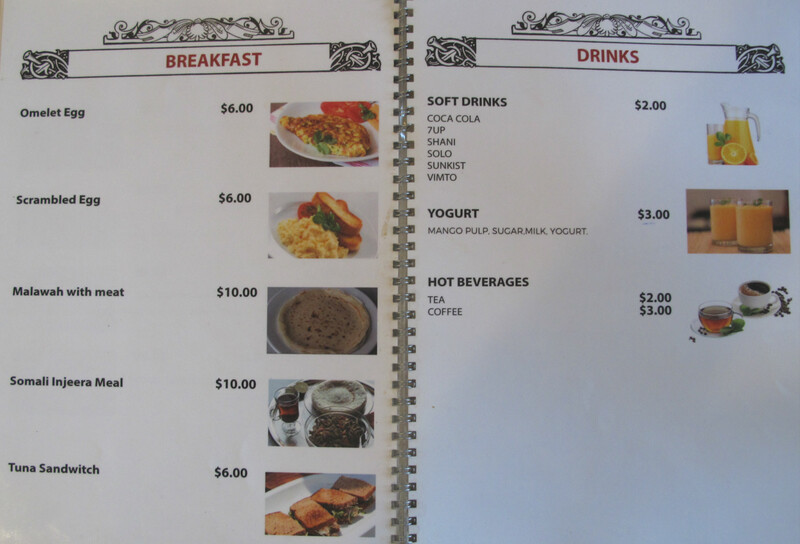 The menu (see below) is quite long and varied, running to breakfast dishes and a tuna sandwich. There’s even a transnational touch in the form of an injera meal. I’m told that’s unavailable this night, so Bennie and I opt for our regular rice/pasta with meat ($15). But first, soup – of course! 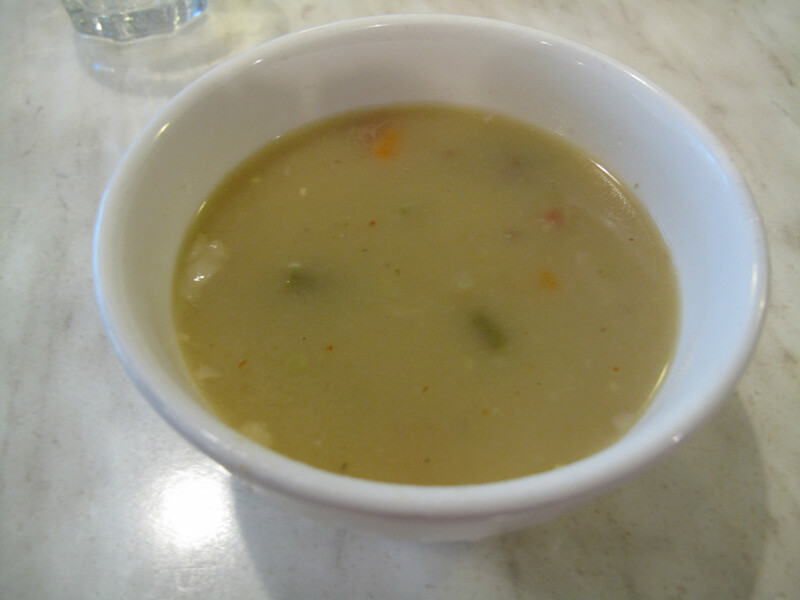 Here the lamb-based concoction is cloudy – almost like a “cream of” soup. There’s nary a trace of meat yet the whole thing is profoundly and deeply flavoured with lamb. … my rice combo with lamb are excellent, matching in every way the quality found elsewhere on this magical strip. Bennie’s spaghetti and its tomato-based sauce is not as wet as some, nor as dry as others, and a touch more oily. He slurps up every strand with glee. My rice is fine but plain. All the lamb is tender and wonderful – even the more hunka chunks. 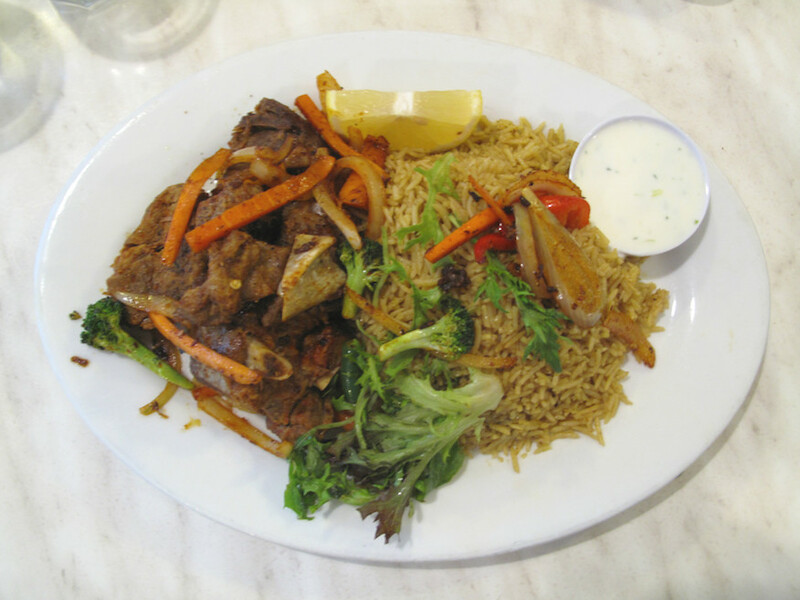 A friend commented this week how he finds the Somalian food at one of his new faves – a Footscray place we have yet to cover – varies depending on who is manning the stoves. 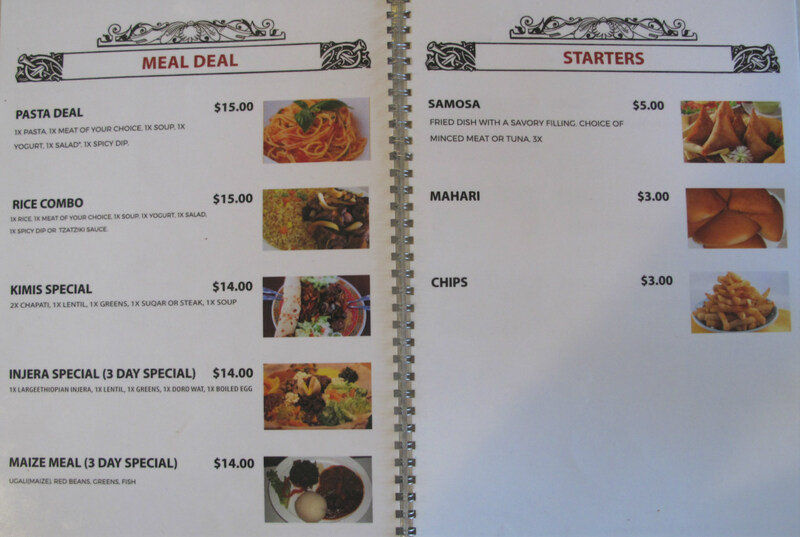 Yes, well – we like that about all our favourite Somalian joints, that the food is hardly ever the same. It varies depending not just on who is in the kitchen but also on the hour of the day and the day of the week! In this case, we are blessed with plentiful amounts of pan-tanned veg – onion, carrot, capsicum and even some broccoli. If not the best part of our meals, the vegetable factor is certainly the crowning glory. Looks great,is it eftpos or cash only? Not sure! We paid cash. Its not new cafe,it was men’s tea chatting room .now open to public. Thank you kenny the tip ,enormous delish food.sahra new fev! No surprises,some of its somali neighbors already doing heavy soul. 3 days injera special menu,why days please? Which days of the week available ? I don’t know. You’ll have to ask the restaurant. Hi Melissa! Not as much of a trendy cafe vibe, but the food is excellent. 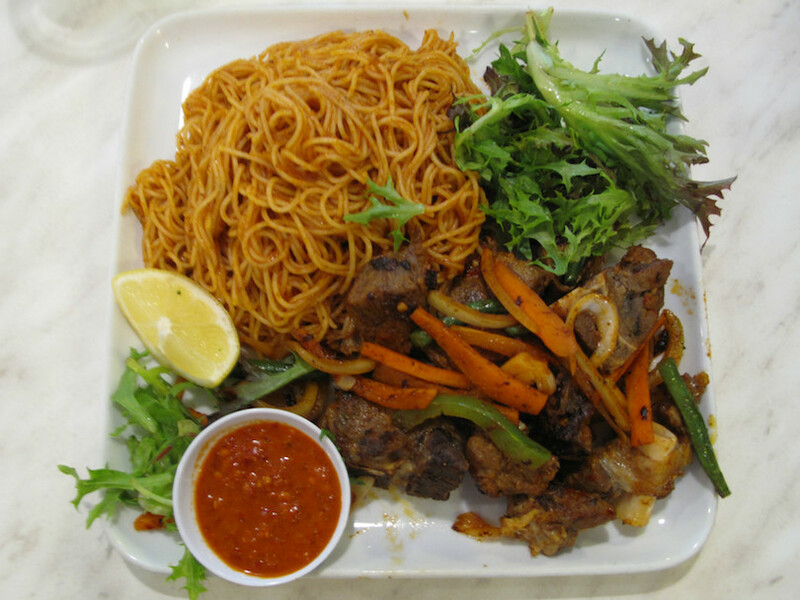 I tend to think of the Somalian places as bit like the Viet ones in Footscray – all mostly good most of the time, so hard to rate. Sahra’s Kitchen is worth a visit. No green sauce, though – just red! That how we feel.been to two somalian,all been excellent.